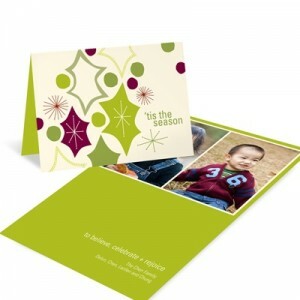 Many people see the words “photo card” and picture the flimsy one-sided cards printed by photo processing labs. Well, you are in for a surprise. We are a stationery company. For us, it is all about the paper. Our fine quality card stock is the same heavyweight, 100 lb. paper used to print fine invitations and personal stationery. The matte finish is smooth, almost creamy to the touch and has a soft, understated look that makes a beautiful impression. Whether you’re looking for Christmas cards, birth announcements, invitations, thank you cards or personalized note cards, a quality card stock makes the difference. By the way, all of our card stock is made from 100% post consumer recycled content, for less of an impact on our planet. Like to test before you buy? We’d be happy to send a sample. To order a sample pack call 1.800.403.8861 and request one. ← PreviousWho do I send a card to?